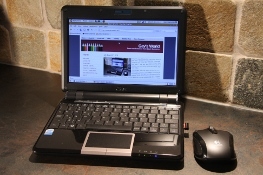 I'd had my Eee PC 4G (701) netbook for about a year when I decided that it was time to upgrade. I'd had my eye on this 901 beastie for some time and when I saw that the price was good at Amazon one day, I went ahead and hit the "Buy Now" button. Unfortuntaely when the laptop arrived, it had two dead pixels. However, I was straight onto Amazon who imediatelly arranged for a replacement to be shipped, which arrived a few days later. Excellent service - also meant that I could still "play" with the faulty one until the replacement arrived instead of having to send it back first. Obviously, being an upgrade on the 701, this is even more of a cracking wee laptop, with a bigger screen, higher resolution, better WiFi, bluetooth, and 20Gig of solid state storage (my 701 had that amount of storage too, but only after a lot of modifications). Specifications, "Out of the box"
This is how the two models compare against each other. With this laptop, I've decided to go straight to *buntu. Before that however, there was a quick hack needed to the default Xandros installation. I've tried many versions of Ubuntu over the years, but have recently switched over to Lubuntu since I think Unity is just pants and when I tried to re-install the Gnome stuff, all of the icons got messed up! (so includes the 10 seconds of BIOS delay). (NetworkManager etc.) loaded, from a fresh boot.